All-New Electric type high-performance injection molding machine｜Products Information｜NISSEI PLASTIC INDUSTRIAL CO., LTD. Since its debut, NEX Series has become one of the best-selling series in NISSEI’s lineup. NEX Series consists of our high-performance all-electric type injection molding machines; the clamping unit generates uniform contact pressure, and the injection unit materializes superior plasticization. The controller provides excellent operability, and its rigid bed structure supports stable high-cycle operation. NEX-IV Series was developed to take these electric type’s advantages to the next level. In addition, NISSEI has been advocating the downsizing of molding equipments. As a pioneer, NISSEI suggests optimum equipments for their clients and reinforces their total support in injection molding processes with the release of the all-new NEX-IV Series. • The newly-designed toggle mechanism can cut the mold open/close cycle time by 5~20%, and the ejector speed is up to 19% quicker compared to the conventional type machines, increasing productivity. • The time-tested “Flat Clamp Mechanism” has been further developed. “The New Flat Clamp Mechanism” improves the evenness of its contact pressure and prolongs the service life of the mold and clamping unit. To improve clamping precision, linear guides come standard for clamping slides, which improve the rectilinearity of the clamp and contribute to prevent molding defects. • Combining the “Flat Clamp Mechanism” with the “Precision Metering” function, which maintains the consistency of metering density and injection volume, it materializes highly-stable precision molding with high repeatability. NEX-IV Series offers one of the widest daylights in the industry while keeping its footprints to industry’s smallest size. By adding 70~140mm to the daylights, the mold thickness ranges have been greatly increased. It flexibly accommodates hot runner molds, molds for long-length products, and modern molds which grow in size in accordance with integral molding or intricate shapes of the products. In addition, die plate dimensions, tie bar clearances, and maximum movable side mold weights have been greatly increased, expanding mountable mold sizes (up to 40% larger than the conventional types). 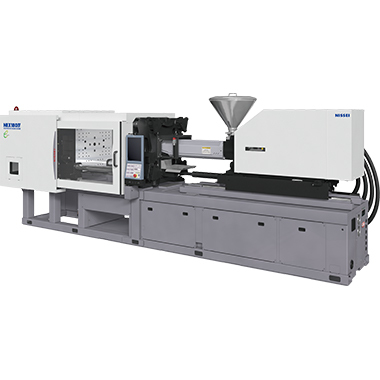 In conjunction with the low-pressure molding method “K-SAPLI™,” which eliminates molding defects and prolongs the life of the mold by lowering the clamping force to the optimum level, one class smaller injection molding machine can be selected and used for an existing mold (one-class downsizing). The clamping unit is equipped with the mechanism and features, such as Flat Clamp, automatic clamping force adjustment, direct clamping force setting, and high-precision mold protection. It is a mold-friendly linear pressure toggle mechanism. With characteristics similar to the straight-hydraulic clamping system, it utilizes the advantages of toggle mechanism, possessing the properties such as hi-cycle, high-precision, high-rigidity, and high-durability. It can easily shorten the cycle time by its faster mold open/close and ejector motions as well as simultaneous motions, such as ejection/mold open during metering and injection during clamping. Low inertia servomotor, NISSEI’s original injection unit, and its control materialize higher speed/response/pressure injection and optimization of barrel temperature control. The NEX type injection unit expands the moldable range and makes high-precision injection and metering possible. For 2EG~12EG injection units, newly-designed and improved plasticization devices are equipped to reduce molding defects by subdividing and optimizing the barrel temperature control zones. New controller “TACT IV” is equipped with large screen, newly designed operation panel, and convenient & user-friendly premium software to improve workability and operability. Quality and production management functions also have been reinforced. ①It facilitates condition management by compiling important process information into one large 15-inch screen. Excellent visibility, operability, and easy molding condition management have been materialized. ②Each process is displayed in a color-coded chart and a feature that assists to shorten cycle is added. ③Newly-added material change purging circuit optimizes the purging conditions, reducing purging resin amount and time. ④Improved operations of quality & production management and maintenance features. ⑤Newly-added mold open/close response speed selector (high-speed, normal, and low-speed) offers ideal selection according to the processes, such as high-cycle, etc. ⑥Molding condition setting to improve yield, which requires high processing skills, made easy by its “Easy Setting.” By automating and simplifying the molding conditions, it can reduce the defective rate. ⑦Set-up screen and description of the adjusters function will guide you through the setup procedures from mounting mold to starting mass production. It shortens setup time as well as simplifying and ensuring the procedures.